AUSTIN, Texas — For the fourth consecutive match, No. 2 Stanford defeated a top 5 opponent, powering past No. 3 Texas Friday at Gregory Gym. The Cardinal (8-1) completed a home-and-away sweep of Texas (5-3), having topped the Longhorns on Tuesday at Maples Pavilion. For the third straight match, junior Kathryn Plummer recorded a double-double with a match-best 18 kills and 10 digs. The outside hitter also had four blocks and two aces. Senior middle blocker Tami Alade hit a season-high .650 with a season-best 14 kills on 20 swings with just one error. Stanford hit .315 as a team, including a .429 clip in the fourth set. For the seventh time this season, Stanford recorded double-digit blocks, totaling 10.0. Texas finished with a .231 attack percentage and 6.5 blocks. Junior setter Jenna Gray controlled the offense, finishing with 51 assists. Flying all over the court, junior libero Morgan Hentz registered a season-high 27 digs. Sophomore defensive specialist Kate Formico collected a season-high eight digs. Freshman middle blocker Holly Campbell, a native of Austin, matched her career-high with seven kills on .357 hitting and totaled six blocks. Junior opposite Audriana Fitzmorris posted 10 kills and two blocks, while sophomore outside hitter Meghan McClure had eight kills, six digs and three blocks. Texas was led by junior Micaya White's 11 kills and nine digs, while freshman Brionne Butler hit .727 with nine kills and two blocks. 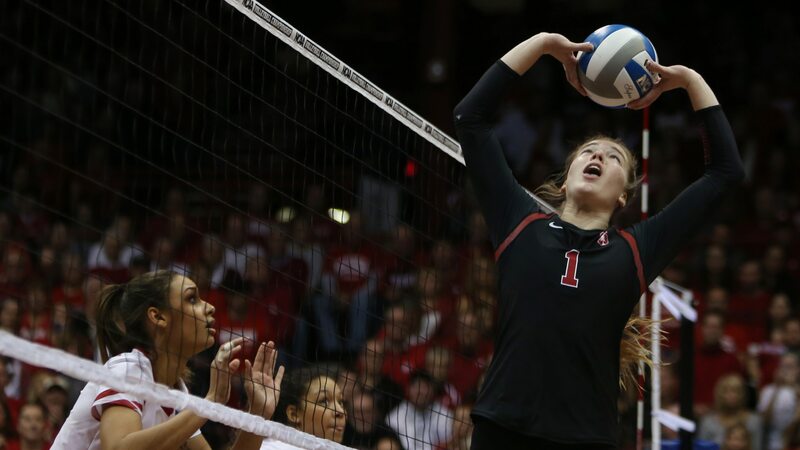 Up next, Stanford returns to the Bay Area to open Pac-12 play on Wednesday at California. First serve is scheduled for 8 p.m. local on Pac-12 Networks.